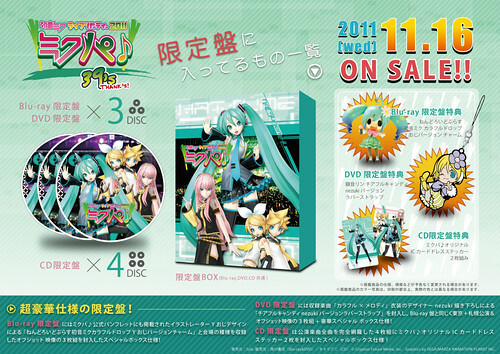 As usual, 2011 MikuPa 39’s will also be released in Blu-ray, DVD, and CD. This time, each pack will receive its own bonus, with the most notable one being Nendoroid Plus Charm Hatsune Miku: Colorful Drop Y-ojisan version which is included with the Blu-ray set (priced at 7770 Yen) containing both Tokyo and Sapporo live performance of the divas. All of this sets will be put on sale at November 16, 2011. This entry was posted in News and tagged charm, hatsune miku, mikupa, nendoroid, plus, vocaloid. I don’t think that’s a nendoroid Puchi actually.